I’ve grown to be a frugal shopper, and whenever I’m out, clearance stickers always catch my eye. I usually pause to at least glance and see what the item is and how much it is discounted. My husband avoids going to craft stores with me because I’m known to get distracted for hours while there. Usually this habit ends up with me just walking away from the item after admiring the sale price. 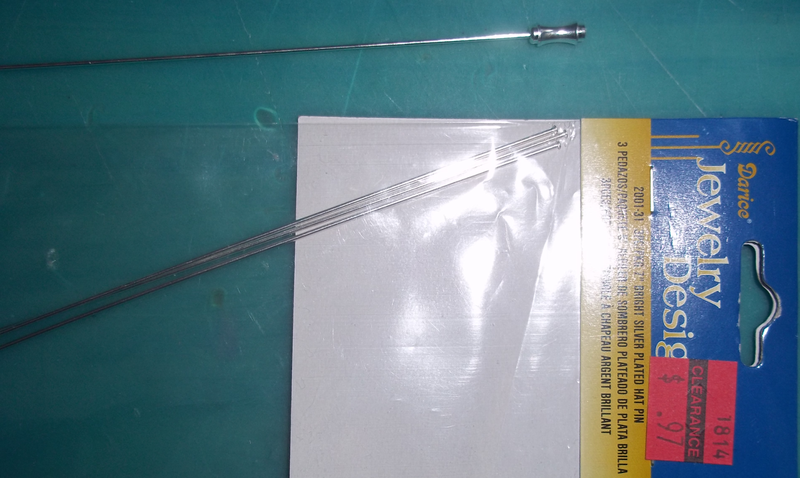 One day while in Jo-Ann Fabrics I happened upon two remaining packages of 7″ hat pins (3 count each package). I had no idea that hat pins existed, what they were doing in a beading section, nor how large of a hat you would need to make use of a 7″ hat pin.. but there they were, on clearance and marked all the way down to $0.97! I’ve been trying to grow my hair out–it’s actually the longest it has been my entire life at this point. With that comes the inevitable playing with ponytails, pigtails and hair buns. So when I saw those hat pins my immediate though was that they would make terrific hair sticks. For a person who has only glanced at hair sticks on Pinterest or in a store before, I’m probably not the prime candidate to teach someone a “how-to” in making them. In the end though, my sinister plan to convert hat pins into hair sticks paid off, and now I have a couple of new hair accessories! Aside from the hat pins, I also used a mix of 6mm and 8mm Czech Fire Polish Beads that I purchased from Beadaholique. The bead mixes I used were called Ever Green and Heavy Metal. The feathers weren’t necessary, but I had some feather earrings I purchased from Claire’s early last year but never could find a reason to use. (When I bought the earrings in the store, it was three earring sets sold together for $10. I can’t find the same set online, so the link is to the closest I can find on their site.) 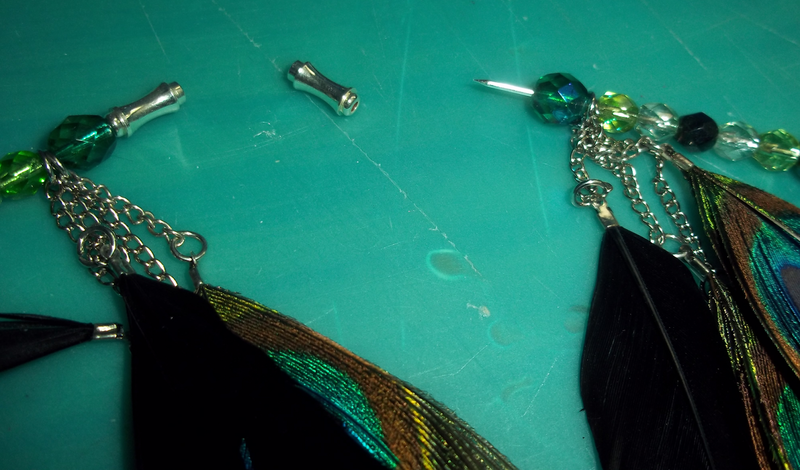 I pulled the feathers off of their earring hooks and threw them onto the hat pin as well. 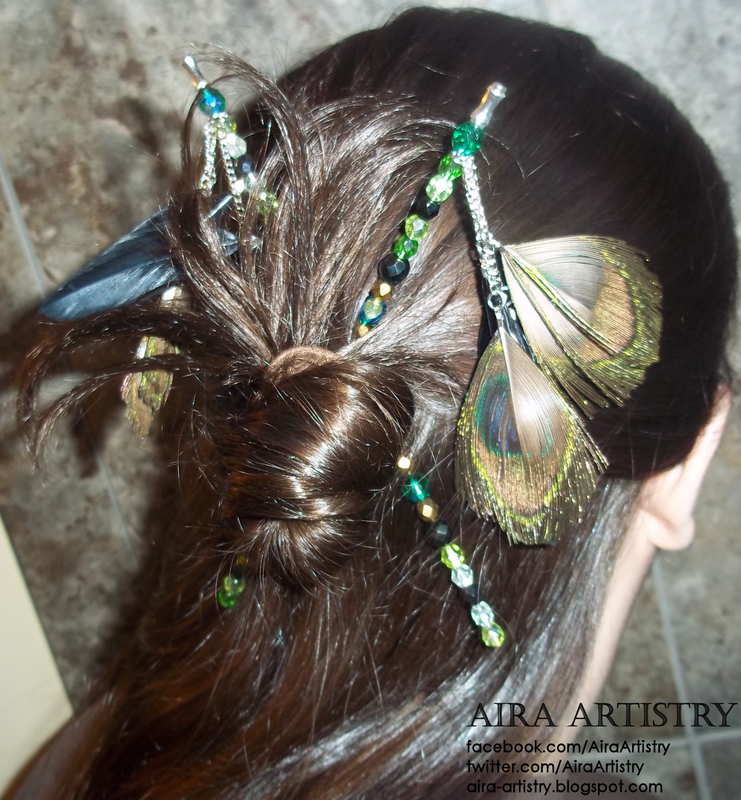 Without the feather earrings, the total cost to make two hair sticks is around $5! Adding in the earrings brings the cost just over $10–but I’m okay with that since those former earrings will now be used instead of sitting around collecting dust! Putting the hair sticks together was quite simple. Remove the topper on the hat pin (be careful not to poke your finger–it is a pin after all!) and slide the beads on in whatever order you like. These hat pins are thick so seed beads, and possibly most pony beads, will not fit. 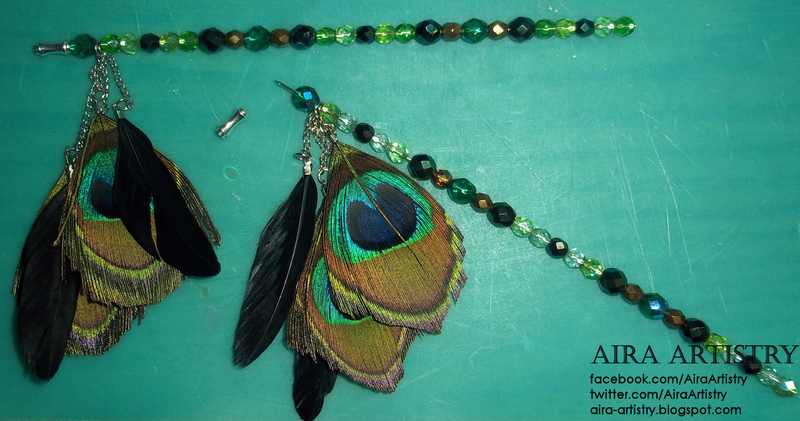 If you’re adding something extra like I did with the earrings, I recommend putting it just below the top bead to keep it from wobbling around on its own. To adhere the topper onto the pin I applied some clear nail polish to the end of the pin and slid the topper back on. Then I put a light coat of clear nail polish between the seam of the top bead and the topper. I left it alone to dry for about 30 minutes (it probably was dry quicker but I wanted to be sure). The topper and top bead, together, can still be yanked off–I did it once testing it–but it requires a great deal of force that shouldn’t occur under normal circumstances. Prior to the nail polish, I tried to use my hot glue gun for sealing the topper and that just made a horrible mess. Luckily the hot glue peeled off! You may be able to use other things such as super glue, but nail polish is effective enough and can be reapplied with ease if needed at a later point. That’s all there is to it! It was a fun side project and I still have four hat pins left to make more sticks with. Whether your cost is $5 or $10, it’s definitely more affordable than any store-purchased decorated hair sticks I’ve ever seen, and that qualifies this project for my first ever Thrifty Thursday. 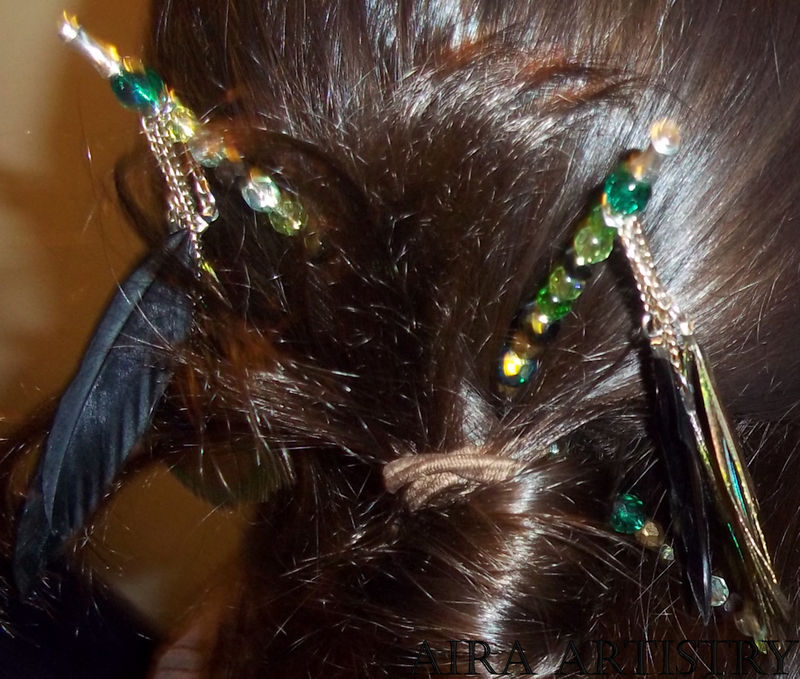 UPDATE: I finished the last two hair stick sets after posting this blog entry. Check them out below!